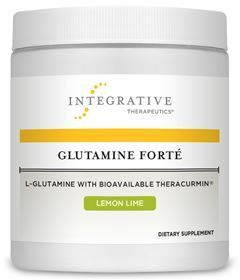 Glutamine Forté delivers a therapeutic level of L-glutamine, in combination with Theracurmin® in a great-tasting, mild, lemon-lime flavored drink mix. Providing 5 grams of L-glutamine per serving with Theracurmin®, Glutamine Forté delivers a novel water-dispersible form of turmeric with dramatically enhanced curcumin bioavailability. Theracurmin HP provides 180 mg curcumin in only two capsules allowing for flexibility in dosing. It is 27x more bioavailable than standard curcumin extracts. Zinc-Carnosine contains the PepZin GI® brand of zinc-carnosine to support a healthy gastrointestinal lining and relieve mild gastric discomforts. * This supplement provides 74 mg of zinc-carnosine per capsule, which matches the dosage used in research. Glutamine Forté provides 5 grams of L-glutamine per serving with Theracurmin®, a novel water-dispersible form of turmeric with dramatically enhanced curcumin bioavailability. Thoroughly mix 1 level scoop (6.7 g) in 8 oz. (236 mL) chilled or room temperature water or juice 1-3 times daily, or as recommended by your healthcare professional. Caution: If pregnant, nursing, taking prescription drugs, or if you have active liver disease, consult with your healthcare professional prior to use. What is the source of the L-Glutamine used in Glutamine Forté? The L-Glutamine that is used in Glutamine Forté is from a natural source; made through bio-fermentation of corn. Are there any drug or nutrient interactions with Glutamine Forté? Caution should be taken whenever recommending, or consuming, nutritional supplements. Healthcare professionals can use this drug-nutrient interaction checker to view potential interactions with the ingredients of Glutamine Forté. Patients should consult their preferred healthcare professional for any supplement questions.